And Happy Earth Day. While we wait for our polar ice caps to stop melting, let's play The Puzzle. WILL SHORTZ, BYLINE: Good morning, Lulu. That's kind of a scary intro there. GARCIA-NAVARRO: One has to remind people that that is happening. And would you remind us of last week's challenge? SHORTZ: Yes, it came from listener Alan Hochbaum (ph) of Atlanta. And I said the letters of Switzerland can be rearranged to spell lizard and newts, lizard being the singular name of an animal and newts a plural. And I said name another country with this same property. What country is it? And the answer is Mexico, which you can rearrange to make ox and mice. Interestingly, no S in Mexico. GARCIA-NAVARRO: We got over 300 correct responses. And our randomly selected winner is Beth Adams of Monticello, Fla. Congratulations. BETH ADAMS: Thank you. Thank you. I'm very excited. GARCIA-NAVARRO: So I hear you are not the first person in your family to win The Puzzle. Tell us about it. ADAMS: That's correct, my husband won back in June of 2014, so we've been desperately trying to get a matching lapel pin for me. GARCIA-NAVARRO: Beth, are you ready to play? ADAMS: I hope so, yes. GARCIA-NAVARRO: Deep breath, deep breath. All right. Take it away. SHORTZ: All right, Beth. Every answer today is the name of a Major League Baseball team. You tell me what they are from their anagrams. For example, if I said scary, S-C-A-R-Y, minus C, you would say Rays as in Tampa Bay Rays. ADAMS: OK. I'll give it a try. SHORTZ: Good. Number one, scuba. S-C-U-B-A minus A.
SHORTZ: Cubs is right. Number two is steam, S-T-E-A-M minus A.
SHORTZ: That's it. Now they're starting to get longer. Despair, D-E-S-P-A-I-R minus I.
ADAMS: Oh gosh, I'm not sure about that one. SHORTZ: I'll give you a big hint here - San Diego. SHORTZ: Padres is right. Here's one down your way, minerals. M-I-N-E-R-A-L-S minus E.
ADAMS: Right. I should know that. You're right. It's right down my way and I cannot think of it off the top of my head. I'm sorry. SHORTZ: Go ahead, Lulu. You can say this one. ADAMS: Oh, yes. Yes. Thank you, Lulu. SHORTZ: How about - oh, here's a tough one. Theistical, T-H-E-I-S-T-I-C-A-L minus I.
ADAMS: Oh, my gosh, that's a long one. SHORTZ: That's a long one. OK, your hint is Oakland. ADAMS: Yeah, no. All I can think of is football. I don't know, sorry. GARCIA-NAVARRO: I also have to tell you theistical does not sound like a real word. ADAMS: Yeah, it doesn't. I agree. I've never heard of that word. GARCIA-NAVARRO: Thank you, Beth. I am going to note my complaint here. My reservation on that one. SHORTZ: Your reservation on that one. I went to the Unabridged for that word. SHORTZ: OK. Here's your last one. And if you didn't like theistical, you're not going to like this word. SHORTZ: It's nonspatial, N-O-N-S-P-A-T-I-A-L. Remove the P. Nonspatial, minus the P, and think of the team in Washington. GARCIA-NAVARRO: My real hometown now. SHORTZ: And it starts with an N.
ADAMS: (Unintelligible), no. I don't even know. GARCIA-NAVARRO: Kind of rhymes with that. SHORTZ: Yeah, that's a tough one. All right. We ended on a tough one. Lulu, you're going to have to give the answer. SHORTZ: It's the Washington Nationals. SHORTZ: Not bad, Beth. Not bad. GARCIA-NAVARRO: ...As well as puzzle books and games. GARCIA-NAVARRO: You can read all about it at npr.org/puzzle. Beth, what member station do you listen to? ADAMS: I listen to WFSU in Tallahassee, Fla.
GARCIA-NAVARRO: Beth Adams of Monticello, Fla., thanks for playing the puzzle. ADAMS: Thank you. Appreciate it. GARCIA-NAVARRO: All right, Will, what's next week's challenge? SHORTZ: Yes, it comes from listener Dan Ezekiel (ph) of Ann Arbor, Mich. Take the name of a famous film director. Drop the first letter of this person's first name. And you'll name a fish. Read the last name backward, and you'll name another fish. What film director is it? So again - famous film director. Drop the first letter of the person's first name. You'll name a fish. Read the last name backward, and you'll name another fish. What film director is it? GARCIA-NAVARRO: When you have the answer, go to our website npr.org/puzzle and click on the Submit Your Answer link. Just one entry per person, please. Our deadline for entries is this Thursday, April 26 at 3 p.m. Eastern exactly. Include a phone number where we can reach you at about that time. And if you're the winner, we'll give you a call. 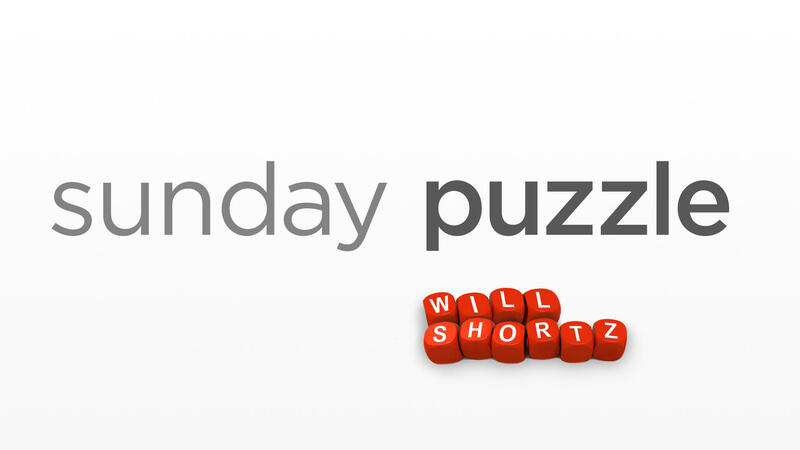 And you'll get to play on the air with the puzzle editor of The New York Times and WEEKEND EDITION'S puzzlemaster, our very own Will Shortz. Thanks so much, Will.